Home Precision Medicine Research Can Transcriptomics Help Find the Right Time to Administer Chemotherapy? For the first time, scientists have tracked the repair of DNA damage induced by the popular chemotherapy drug, cisplatin, at the whole-genome level in a mammal around the clock. Using single-molecule sequencing, the team of scientists lead by Nobel laureate Aziz Sancar, M.D., Ph.D., found that DNA repair of transcribed genes is controlled by two circadian programs in mouse tissue. 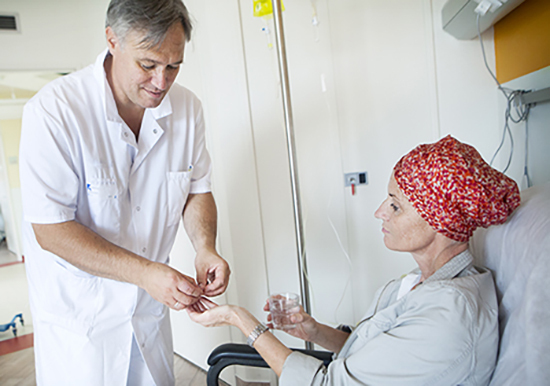 The findings are a significant step toward a goal Sancar has been working toward for 15 years: developing mechanism-based cisplatin chronochemotherapy protocols that will reduce toxicity and tumor resistance in cancer patients. “This was the first time the repair of DNA damage caused in an animal was analyzed at the whole-genome level at single-nucleotide resolution,” says Sancar, a professor of biochemistry and biophysics at the University of North Carolina School of Medicine. Sancar is the senior author of the current study, which appeared in the May 7 issue of the Proceedings of the National Academy of Sciences. Sancar is hoping to reduce the negative impact cisplatin can have on cancer patients by taking advantage of the body’s natural DNA repair clock, something scientists have been trying to do for 30 years. These scientists, argues Sancar, just didn’t have the right tools. “The development of next-generation sequencing has revolutionized the field, and that is really what enabled us to do this study,” he says. In the current study, Sancar and his team injected mice with cisplatin over a 24-hour period. After each injection, they took tissues and analyzed the repair pathways. “We generated a circadian repair map of mouse kidney and liver,” Sancar says. (Damage to these organs in humans treated with cisplatin is common.) In 2015, another team led by Sancar developed a method for isolating DNA fragments that are removed by repair enzymes and, using RNA sequencing, generated repair maps for DNA damage in human cell lines, plant cells, and E. coli. The current study describes the first time those methods have been applied to the whole animal, Sancar notes.